Balanced Scorecard is a strategic diagram that allows a balanced approach to performance measures to be modeled. 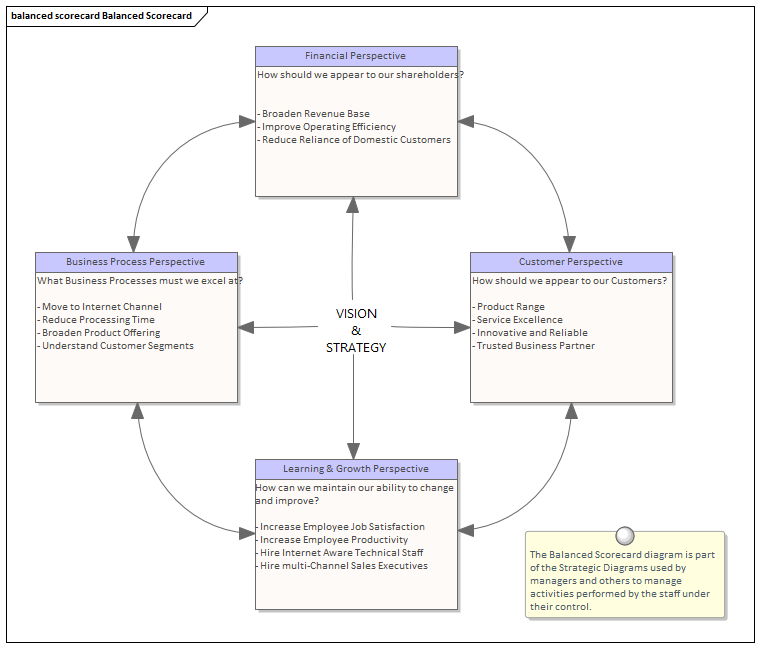 The diagram can be created from a Pattern that adds and connects the four perspectives: Financial, Customer, Internal Business Process, Learning and Growth. Most organizations of any appreciable size will be using some type of Balanced Scorecard approach to align business activities to the vision and strategy of the organization, to monitor performance against strategic goals and to improve communication. The Balanced Scorecard diagram is part of a set of strategic diagrams that allow many aspects of an organization's business to be modeled. A Balanced Scorecard can be used to ensure business activities are aligned to the vision and strategy of the organization, to monitor performance against strategic goals and to improve communication. The Classes representing the four Perspectives can be traced to other elements in the models, such as Goals and Business Capabilities, and also to Linked Documents that allow the Perspectives to be documented.